SKYINTECH control systems make use of human-centric design and takes into consideration every aspect of the operator’s interaction with your plant equipment and process control system. We carefully consider the type of information the operator receives and how much of it is delivered. We design our control systems so the operator can understand and manage abnormal situations quickly and precisely. At SKYINTECH, we go a step beyond, believing that operators of all skill levels should be able to manage multi-unit operations, and safely deal with iregular events with efficiency and effectiveness. ensuring safe process and plant operation when anomalies occur. This includes providing the operator with all pertinent information to make the correct decisions regardless of skill level, and not overwhelming the operator with excessive information. ensuring all required information within an area of responsibility is presented clearly and concisely. This includes the use of high-level overview graphics that allow the quick determination of the condition of all unit operations. 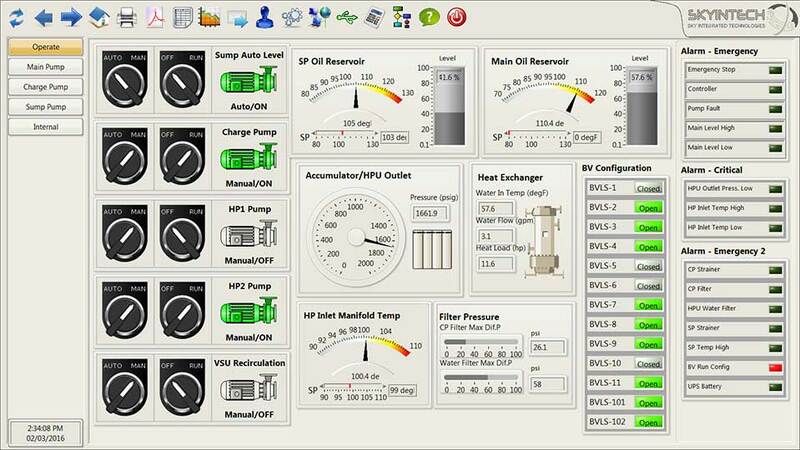 Mid-level graphics are used to aid making adjustments to processes, data entry and more specific control of unit operation performance. Low-level graphics and displays deliver various diagnostics and analytics. ensuring an organized, accessible and recognizable interface color palette that reduces eye strain and eliminates visual dissonance and distraction. This helps with moving attention away from normal operation and towards abnormalities. Alarm indications make use of both color and shape, and are kept consistent across all related displays. ensuring a more complete understanding of where the process is in the past, present and future, and clear, detailed display of whether it is within acceptable limits, as opposed to the limited features of traditional PID graphics.